TravelHerd now incorporates credit card payment proces sing using Authorize.net. Authorize.net processes over one billion transactions per year for over 430,000 merchants. We selected Authorize.net as our credit card processing partner because of their award winning API integration and customer service. TravelHerd credit card payment processing is available in our on-line Book Now tour booking engine as well as from invoice emails generated within TravelHerd for any reservation with an open balance. TravelHerd uses the Authorize.net Accept suite. After much research, we chose the Authorize.net Accept suite as the credit card payment processing solution for TravelHerd for its extensive on-line security and ease of use for the end-user making the payment. This solution is a SAQ-A level PCI compliance. To make a payment, the credit card information is entered on the Authorize.net server via an overlay on TravelHerd scripts. All TravelHerd subscriptions have incorporated this value added service. Subscribing companies may choose to use credit card processing using Authorize.net or not; its use is neither obligatory nor automatic. TravelHerd subscribing company administrators can activate credit card processing using Authorize.net for their company via an option in their TravelHerd company settings. Administrators must verify that their credit card processing bank has set up their company credentials with Authorize.net prior to activating this functionality. There is no additional charge to the monthly subscription rate. TravelHerd does not receive remuneration from Authorize.net for this value added service. Click here to schedule a demo for TravelHerd including credit card payment processing using Authorize.net. Home of the Herds hosted websites can use the TravelHerd WordPress interface for scheduled tours, specials, hotel descriptions and scheduled activities. The synergy between the two applications saves you from dual information entry and its maintenance. It also precludes the issue of scheduled tours, specials, hotel descriptions and scheduled activities having to be updated in each application when revisions become necessary, thus avoiding out-of-sync data between the two applications. Scheduled activities can generally be described one day or less tours (sightseeing, docent and self-guided) and activities (classes, cultural, sporting, spa and dining, etc.). 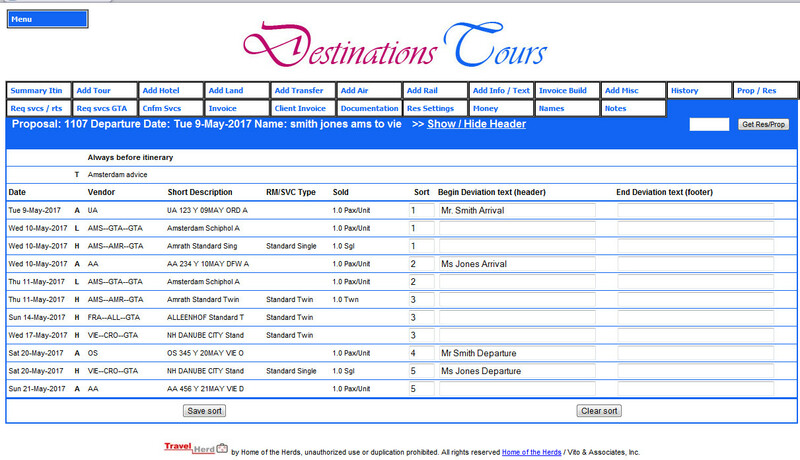 When selling scheduled tours and specials, the information for each specific tour is entered once but the data is utilized in both TravelHerd and your WordPress website using the TravelHerd WordPress interface. 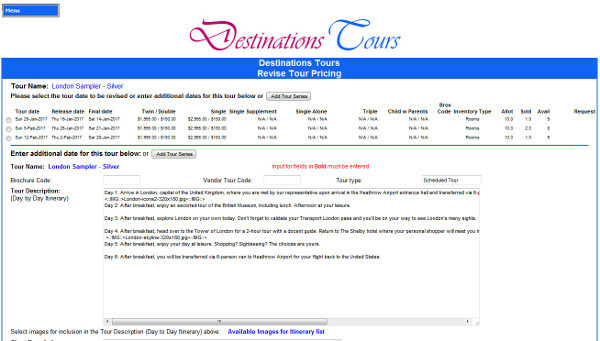 The tour selling prices and accruals are entered into your TravelHerd application and dynamically display on the tour’s web pages on your WordPress website. The tour itinerary text, including embedded images, is loaded in your WordPress website and get utilized as the tour’s itinerary in your TravelHerd database. The TravelHerd WordPress interface process saves hours of maintaining dual databases in separate applications with the inherent issue of out of sync data. For companies not selling scheduled tours or specials, the TravelHerd WordPress interface can be used to display sample itineraries with “From” pricing or without any pricing component at all. Hotel descriptions and scheduled activities are loaded only once in WordPress posts. The hotel vendor set-up in TravelHerd utilizes the appropriate WordPress post for day to day itineraries created in the TravelHerd booking engine. This functionality includes XML hotel vendors accessed via the TravelHerd XML interface; if using multiple XML vendors for the same hotel, the same description taken from your WordPress post can be used across vendors. The same holds true for scheduled activities, wherein TravelHerd utilizes these WordPress posts, making them ready to book into your TravelHerd itineraries. 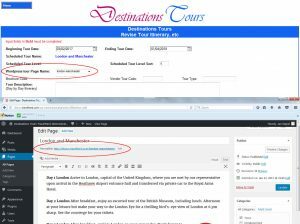 Using the TravelHerd WordPress interface also makes it a breeze to set up your scheduled tours and specials for on-line sales using the TravelHerd Book Now (B2C) and TravelHerd Travel Agent Portal (B2B) features. Both TravelHerd Book Now and TravelHerd Travel Agent Portal are excellent avenues to increase your bookings and revenue without the direct interaction with your staff. Contact us today for a TravelHerd demonstration and learn about these exciting features and the TravelHerd application for yourself. TravelHerd has very flexible profit modules. For mark-up modules, this includes single tier, double tier and mark-up via either division or multiplication; these modules are elaborated upon below. – Single tier from net cost to selling price with optional seperate mark-ups for travel agents and direct consumers. The mark-up can be done by division or multiplication. – Double tier from net cost to net selling price and net selling prices to gross selling price. The second step is with optional separate mark-ups for travel agents and direct consumers. The mark-up can be done by division or multiplication. Mark-up parameters are set company-wide. Lead reservation agents and those with higher authorization levels can set their own mark-up parameters as well as adjust these mark-up parameters for individual components of their choosing within the scratchpad or reservation, as the situation requires. Additionally, when setting up products in the TravelHerd database, FIT components can be loaded as mark-up per person, mark-up per unit, pre-calculated per person or pre-calculated per unit. A flag can be set for components where the selling price and commission cannot be overwritten at the reservation level; this is often used for fixed items such as insurance. Default commission levels by product type (FIT vs. Tour) are set company-wide. A commission cap can also be set by product type. Lead reservation agents and those with higher authorization levels can set their own commission levels, per reservation or by service, up to the commission cap. A separate commission level and cap can be set for scheduled tours by departure date. In both the scratchpad, used when preparing quotes, as well as within an existing reservation or proposal, the profitability based upon the selected mark-up and commission can be displayed for easy reference. Sell scheduled tours and specials from your TravelHerd database online via the Book Now online reservation portal and boost your reservations! 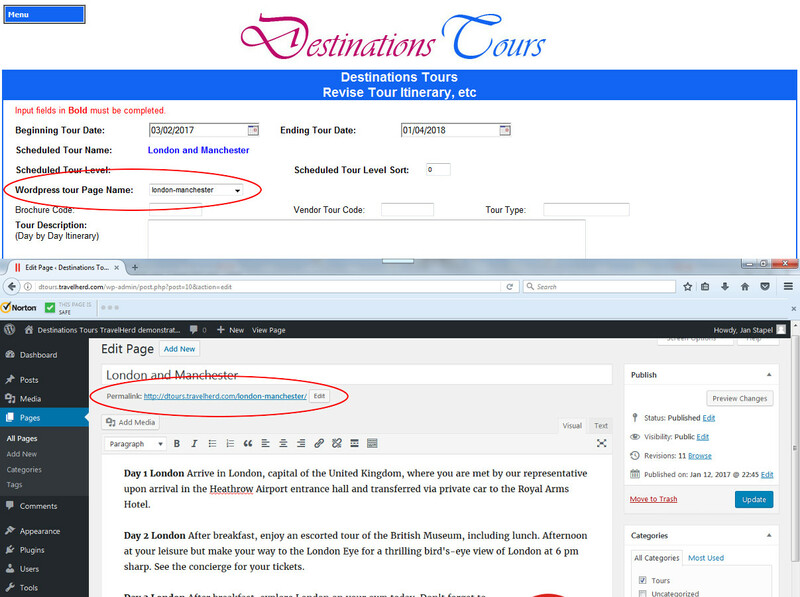 The Book Now module utilizes a pre-formatted link on your website to the TravelHerd application. Tours offered may also have single or multi level itineraries and pricing as well as in-tour options and pre and/or post extensions. 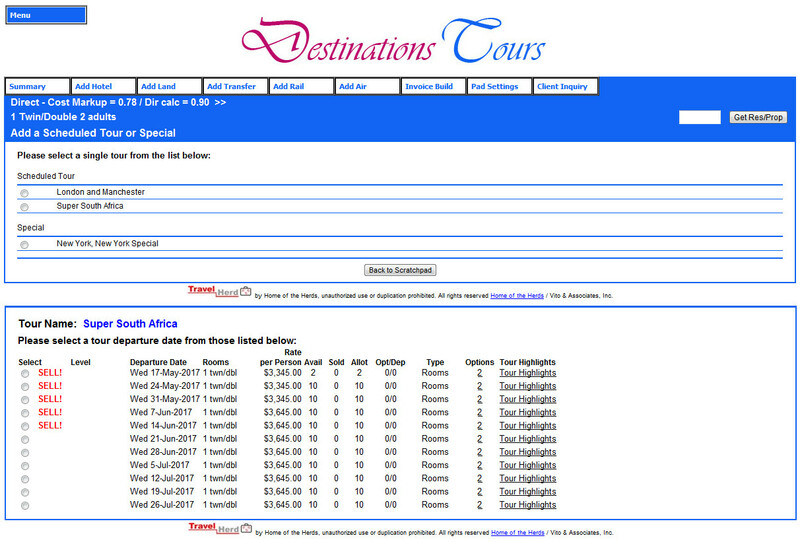 When a visitor to a TravelHerd subscribing company’s website clicks on the Book Now online reservation portal link, they are presented with the large main image of the selected scheduled tour with a calendar detailing upcoming scheduled departures for that tour and an option to revise the room requirement(s) as needed. 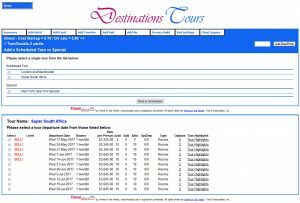 For those TravelHerd subscribing companies using the TravelHerd WordPress interface, the itinerary and database loading offers of scheduled tours and specials a more streamlined process. 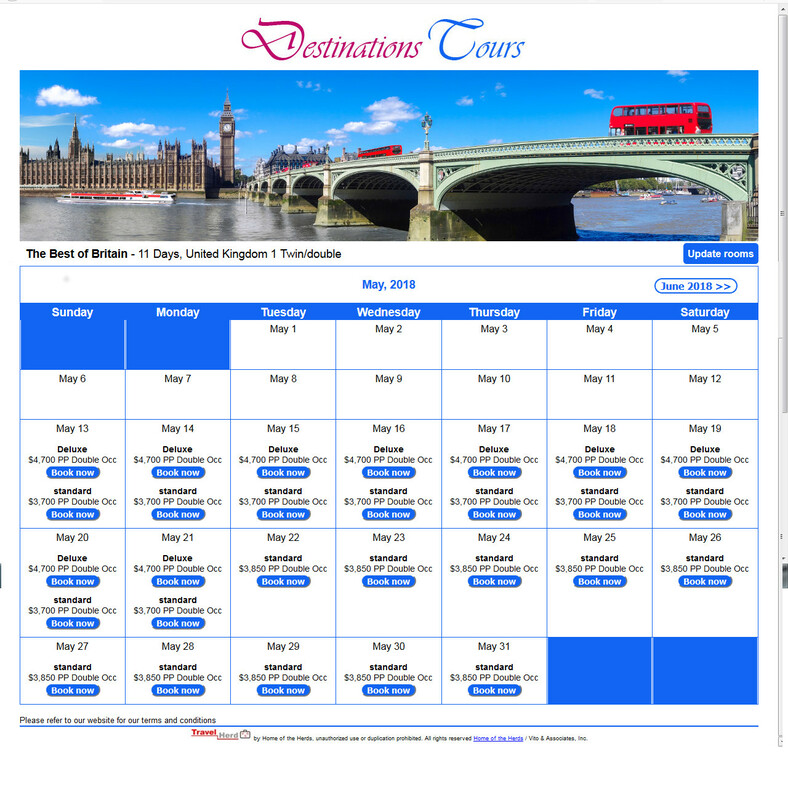 The calendar display details the first instance of a scheduled tour which can be booked or requested, as you have the option to cut-off online sales x days out. For days when the tour operates, it will display the per person double occupancy rate and indicate whether it is on request or available for instant confirmation. The room requirement is set to 1 double occupancy room with an option to easily revise the room requirement(s), both in quantity and room occupancy type, and the calendar will redisplay with the rates and availability based on the new room requirement. The calendar can be advanced to other months, as required. 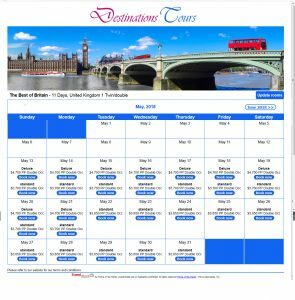 Select a departure date, to reveal the large, main image of the selected scheduled tour followed by a detailed day-to-day itinerary including any embedded images. Upon selection of a tour departure date from the display, a total gross selling price with a per person breakdown is calculated and the visitor is prompted to enter their email address. If the email address entered is known to your TravelHerd database, the visitor’s required contact details will be displayed. Visitors with email addresses unknown to your TravelHerd database will be required to enter their contact details. In either case, the passenger names, genders, optional dietary requirements, and country of passport issue must be entered prior to submission; these details can be updated later in TravelHerd by your staff, if required. Terms and Conditions, either for your company or tour-specific are also detailed at the bottom of the screen display. 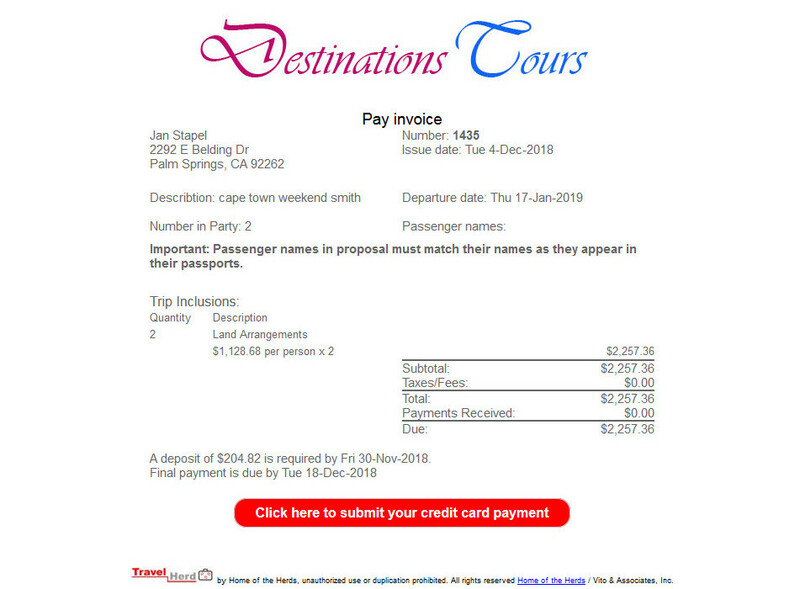 Upon submission, a proposal is created in TravelHerd and the purchaser is emailed a combined itinerary-invoice which also details the payment terms. 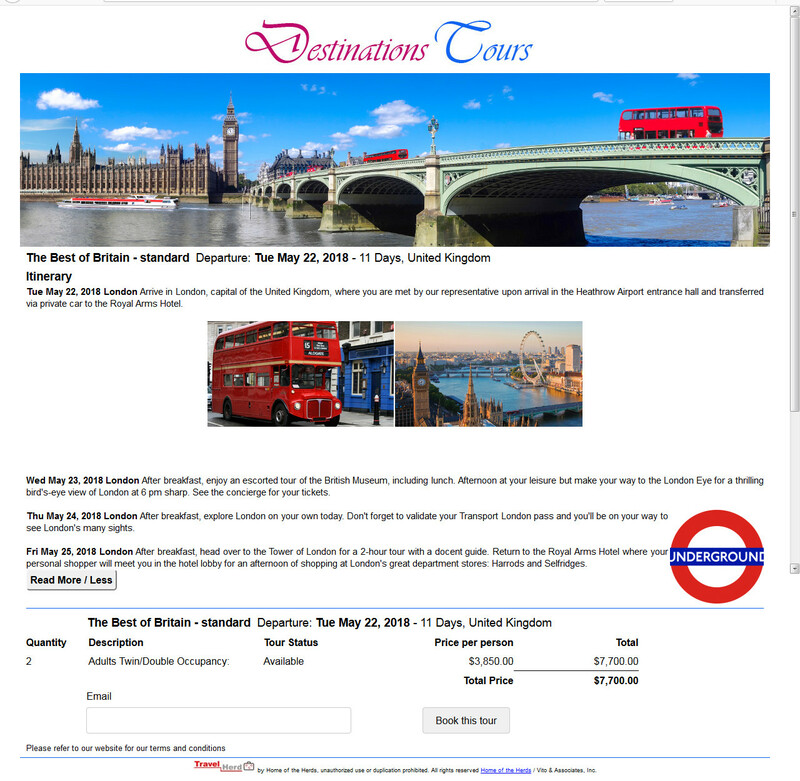 An email is also generated to the TravelHerd subscriber advising the proposal, tour and departure date, rooming requirement and the purchaser’s contact information. A unique email address at your company can be assigned for Book Now email communications. The on-screen display will then update to a thank you message which reiterates the tour information which they’ve now booked. 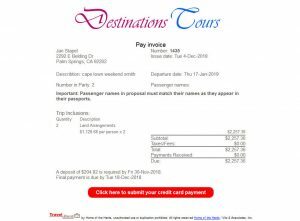 The reiteration also includes pricing and, if the purchaser’s email address is a travel agent in your TravelHerd database, the commission amount. When the reservation is completed, accruals are automatically added to the proposal, if they have been loaded into your database for the specified tour. Book Now reservations are tagged with WWW for easy identification. TravelHerd’s Book Now online reservation portal is a boost to your company’s reservations and a great adjunct to your sales and marketing efforts! TravelHerd has a unique FIT booking engine consisting of a scratchpad to produce quick quotes and the reservations module for highly customized FITs, scheduled tours and other travel options. 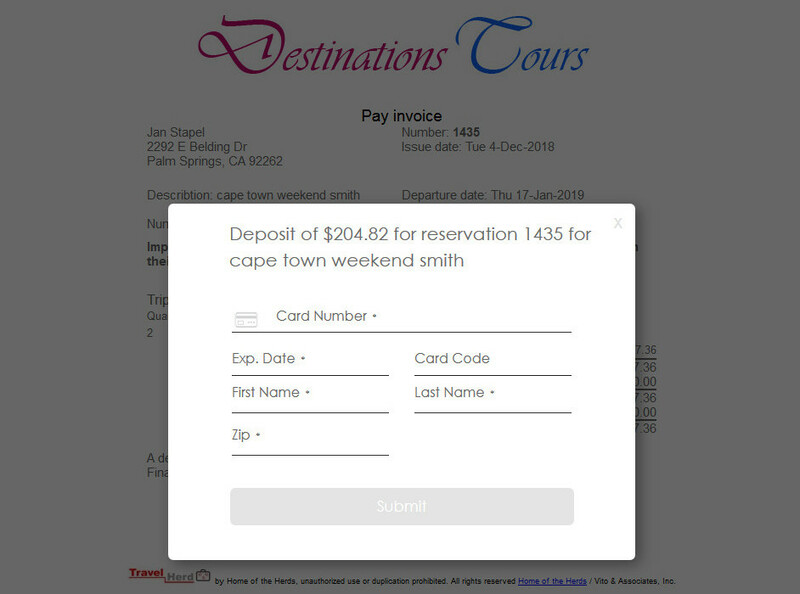 The scratchpad and the reservations module both utilize XML, vendor web sites and the internal database in TravelHerd in the booking process. Items added to the scratchpad can be generated into a proposal with the inclusion of the booking agent’s information, whether they are a travel agent or a direct consumer. Proposal and reservation itineraries and invoices can be emailed to booking agent/now client. Services queried via an XML interface can be stored in the TravelHerd database, based to the user’s authorization level. Stored services for hotel, land and transfers display at the top of the list of available options, thus directing entry level reservation agents to preferred product. Booking from the stored services is faster because queries are made based on a single item as opposed to searching by destination. The default flag is set to display only refundable services with an option to show all services. Queries may also be done based on available services, e.g. star rating, business center, swimming pool, etc. for hotels, with similar options for land and transfers. Single step multiply if the markup is higher than 1 or divide is the the markup is less the 1. Double step multiply if the markup is higher than 1 or divide is the the markup is less the 1. A separate mark-up can be set for travel agents and direct consumers. TravelHerd supports two exchange rates per currency, one for buying and one for selling. The TravelHerd reservation module uses the same principle as the scratchpad for additions and revisions to an existing reservation. Additionally, a single tour can be provided with multiple pricing levels. The nomenclature for the pricing level is controlled by the client. Pricing levels and inventory type can be revised from season to season or ad hoc as required. The scheduled tour inventory set-up details the inventory usage for previously entered tours. In the event of occupancy based inventory, actual inventory is not required for every occupancy type. 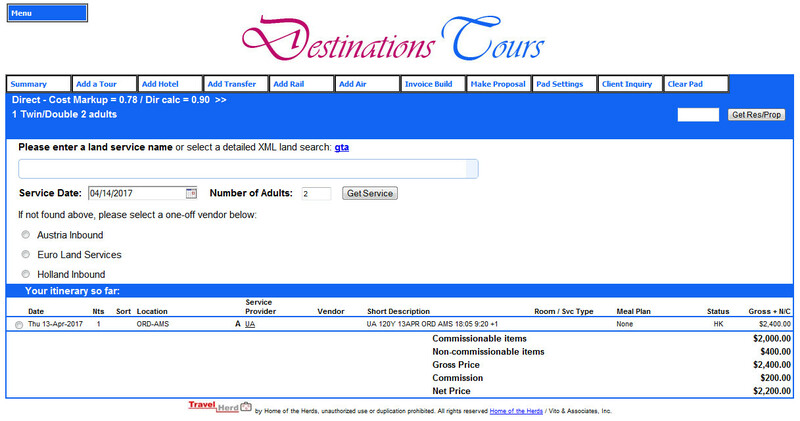 TravelHerd will confirm from scheduled tour inventory what is available, i.e. twin confirmed, single on request. Online sales of tours book from the same inventory and follow the same inventory rules; the online buyer of a scheduled tour is advised what can be confirmed at the time the buyer makes booking. With multiple level inventory for scheduled tours, tour inventory is set to zero as soon as the release date has been reached. The release date is set as a number of days prior to the tour departure date. A more strict online cut-off number of days prior to departure can be set in the TravelHerd company settings. Availability is calculated by counting actual confirmed persons, rooms or occupancy types including temporarily-held persons, rooms or occupancy types booked or in-process bookings made by the internal sales consultants/reservation agents. This ensures that true availability is shown at all times. A TravelHerd report displays temporarily-held inventory booked or in-process bookings made by the internal sales consultants/reservation agents, confirmed inventory as well as tour inventory on request. TravelHerd can also accommodate tours with shared inventory. These may be Land-only and Land and Air tours or Complete itinerary/Partial itinerary tours. In these situations, TravelHerd allows for shared inventory for the related tours.